From the mouths of babes! The fresh-women, of the Democratic Socialist Party are taking control of the left, far left. Democrats supported these nukes to get them elected in order to take control of the House but can not control them. Nice job. Nancy did her best, leaving Ocasio-Cortez out of the Climate Change Committee. But, that will allow her to continue to say what she wants, when she wants. She will continue to be ignorant from it all. Nancy and the Democrats do not know how to deal with their newly elected agitators. The Socialists from “The Party” have drunk the poisonous Kool-Aid served by these wild, misguided kittens. Dems have jumped on Ocasio-Cortez’s ridiculous New Green Deal and why not it got her attention. Anything stupid and destructive now becomes part of the Democratic Socialist’s agenda. Rep. Omar’s anti-semitic comments came deep from her Muslim heart. The Dems have a highly populated Jewish membership. Lots of money. By the way, the Green Deal includes more BS than just addressing climate change. What does eliminating ICE have to do with climate change? Nothing, its the way socialist work, by destroying. Cortez would spend trillions for a program that will ruin America, economically and physically. Spending 5.7 billion to build a wall for our national security, violates everything socialistic and disrupts Cortez’s nutty mind. Anything resistant to Trump is supported by the Left. The Democrats have a serious problem, however, since stupidity has become the ground base of their party, they will grab on to the tails of these dogs and run further into the Deep Dark State. 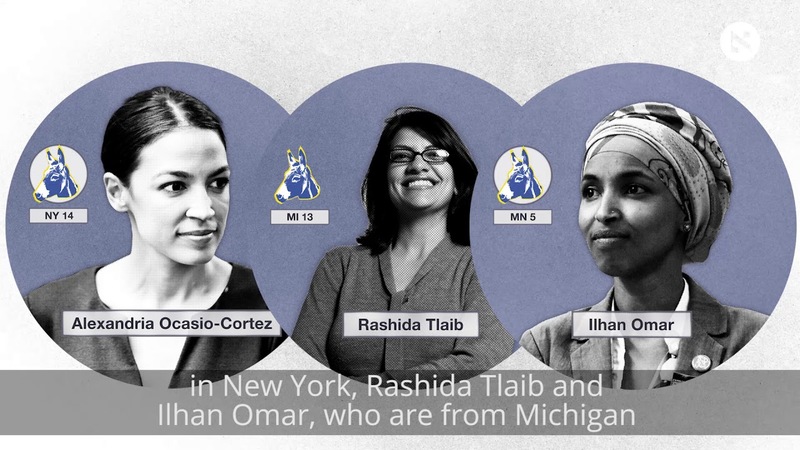 Ocasio-Cortez, Tlaib and Omar are the greatest gifts from the Democratic (Socialist) Party to President Donald Trump. The American people are laughing, and scared of these cartoonish monsters. To some of those previous Trump haters, the President isn’t looking so bad now. This is why the Democrats want the border open, and illegals allowed to vote. They need their votes (to continue to grow the Nut House). Common sense Americans will drift away from the Democratic Socialist Party of DESTRUCTION. Keep talking ladies. The Democrats may be coming out criticizing Omar’s anti-semitic comments, but only because it is the politically correct thing to do. Realistically, THEY GOT WHAT THEY ASK FOR, even though she was elected from a Muslim populated district. Democrats were proud to have her, she helped carry the Nut House.